Stocks continue to head lower this afternoon. The S&P 500 is now trading around 1498, down 1.1 per cent. The Dow Jones Industrial Average is now down 100 points. 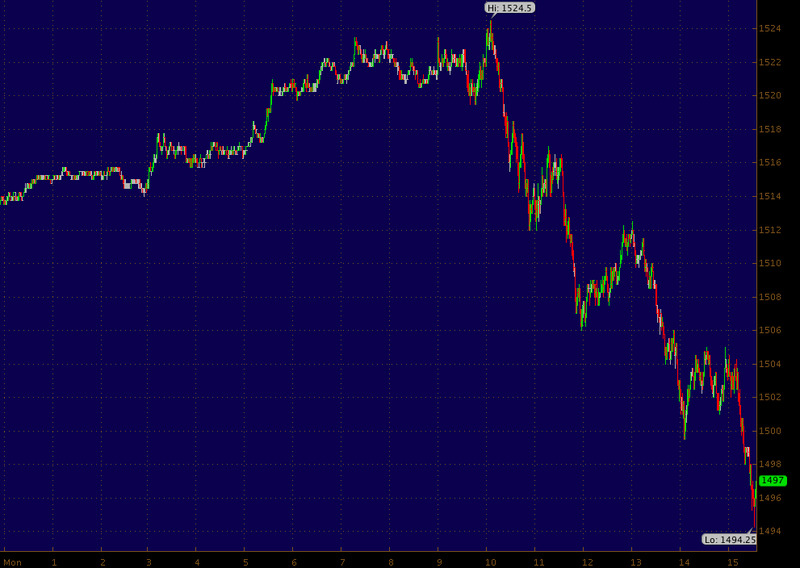 It’s not just stocks, though – the yen is surging against the dollar, even while the euro tanks. In other words, this is risk-off. Earlier this morning, initial results looked like the market-friendly centre-left candidate was ahead in the Italian elections, but new reports are projecting former Prime Minister Silvio Berlusconi’s centre-right party in the lead for the Senate race. The Dallas Fed’s monthly index of regional manufacturing activity also came in weaker than expected.